Once you've been bitten, you become smitten, as the “beary” best friend of Christopher Robin--Winnie the Pooh-- observes in his human sidekick after Christopher drops out of sight. And his fears are confirmed when the boy is found making a Valentine's Day greeting for a girl named Winifred instead of designing cards for Winnie the Pooh and Tigger too! After Rabbit warns them how serious love sickness can be, the group bands together, determined not to let Hundred Acre Wood turn into Wuthering Heights. 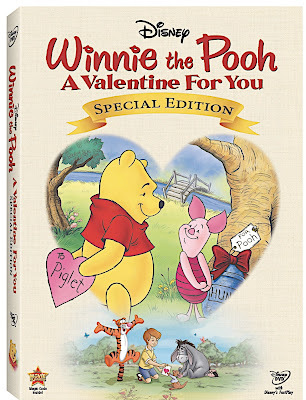 In addition to the narrator's early reminder heard in this adorable Special Edition of the 1999 release that “change does not come easily to some bears... especially when that bear is Winnie the Pooh,” we're quick to discover that Valentine's Day is just as stressful for our animated friends it is for those of us in the real (live action) world. While some of us take pleasure in chocolate or dates with individuals we're just not that into to avoid celebrating alone, Pooh's insecurity over Christopher Robin's preoccupation causes the silly old bear to become even more absentminded than usual. As the irresistible main feature Un-Valentines Day begins, Pooh forgets holiday altogether with a priceless, “you mean Valentine's Day falls on tomorrow this year?” before he later laments Eeyore-style that “this is the saddest Happy Valentine's Day” ever. Fortunately, everything changes when Christopher Robin's love-sickness prompts them to learn that a girl is "like a boy but different” as they're led on a heartwarming journey after Pooh receives an anonymous gift of Valentine's Day honey instead of our traditional chocolate. More than just a delightful Valentine, the program is surprisingly filled with rich wordplay including some challenging vocabulary better suited to middle school students than the traditional preschool Pooh demographic. Although it stands on its own as a rare family disc sure to captivate all ages and one that I enjoyed far more than some of the recent recycled, episodic re-releases, its added benefit of language building by encouraging children with context clues and dazzling us with tongue-twisting jokes is still refreshing eleven years later. Rounding out the disc with a bonus episode and Valentine's Day cards as well, it serves as a high quality Disney offering for series fans who discover as "the silly old bear" does with Christopher Robin, that there is always a special place for friends and Poohs both new and old in our hearts.